For more than 17 years and 13,000 flights, Vanderbilt LifeFlight has been providing emergency care to residents of Montgomery County and surrounding areas. 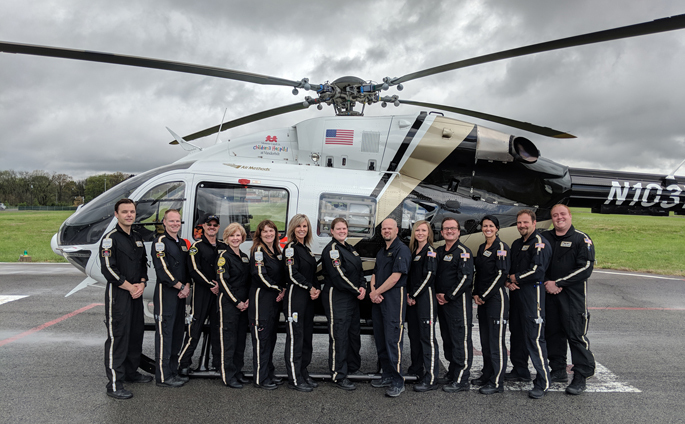 With a staff of 13 medical crew members, four pilots and two mechanics, the helicopter base is one of the busiest out of eight LifeFlight bases and covers more than 11,000 square miles. The base opened in October 2002 on the campus of Memorial Hospital (later renamed Gateway Medical Center), on Madison Street in Clarksville. The helicopter sat on the helipad at Gateway and the on-duty staff had living quarters in a clinic attached to the hospital. Gateway Hospital’s then president and CEO, Randy Kelley, said at the time that Gateway had partnered with LifeFlight because of their exceptional safety record and patient care. When a new hospital was built in 2008, the hospital became Gateway Medical Center and the move to a new campus also brought a move for LifeFlight to Outlaw Field. A ribbon cutting was held in 2009 for the new hangar and expanded crew housing at the airport. The first aircraft placed in Clarksville (at Memorial Hospital) was a $2 million-dollar American Eurocopter BK117. The twin-engine aircraft is one of the safest in the industry. In 2004 an $8 million American Eurocopter EC 145 twin engine helicopter replaced the aircraft. That aircraft underwent a multimillion-dollar refurbishment in 2017 and continues to service the community. Chief flight nurses (base managers) have included Henley (2002 to 2012), Michele Brazil (2012 to 2014) and Joe Brentise (2014 to present). Brazil and Brentise continue to work at the base, while Henley works out of the Paris, Tennessee (LF 6) base. Each have fond memories of the community. “So many people in the community were so helpful and instrumental in bringing the LifeFlight helicopter to the community. Charles Hand and Gary Matthews were pivotal in making sure that we could build and lease our facility at Outlaw Field,” Henley said.